With the launch of the official Android app today, Instagram has released updated stats that show the stunning growth of the service over the past 18 months. 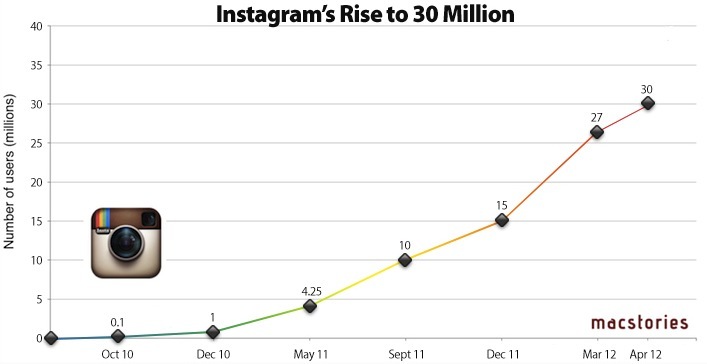 It was only back in December 2011 that we reported 15 million users had signed up to Instagram; the growth rate of the service is accelerating, as the company announced 27 million users in mid-March, and 30 million users today. The Instagram Press Center reports additional numbers, including 1 billion photos uploaded so far, with 5 million photos each day and 575 likes per second on average. In the past year, Instagram has added new designers to its relatively small team based in San Francisco, who helped revamping the iPhone app and worked on the launch of the Android client. More recently, Instagram started opening up its API to allow developers of other mobile applications to directly upload photos to Instagram -- that was the case with Hipstamatic, and the company is keeping an eye on this API experiment to see if wider adoption among developers could lead to an even faster growth pace. The launch of Instagram for Android will surely help, as more than 430,000 users were already on the waiting list for the app. Looking back at Instagram's success over the past two years, it's clear Instagram has become one of the fastest growing social networks that launched exclusively on iPhone. While many are wondering when the company will decide to monetize the service with advertising, more partnerships, or other plans, Instagram says they are actively considering more devices and platforms for the future.